You can’t throw a rock without hitting a coding toy these days. In just the last couple of weeks both Apple and Sony have announced new initiatives, and now Overdrive-maker Anki is getting in on the action with Code Lab, a simple and free programming language designed to teach kids to code with its Pixar-inspired robot, Cozmo. The move is no-brainer on Anki’s part. The hardware startup has already opened up Cozmo’s code to developers, and a number of schools have embraced the adorable little robot as a method for teaching beginning programming. Prestigious robotics university Georgia Tech has adopted Cozmo for its beginner course, Introduction to Perception and Robots, due to its small size, vision system and database of hundreds of facial expressions. Cozmo Code Lab is, naturally, a much more simplistic version of what’s been made available to Georgia Tech and the like. The software is based on Scratch Blocks, an education coding system jointly developed by MIT and Google, so it’s not some closed proprietary system created in-house. 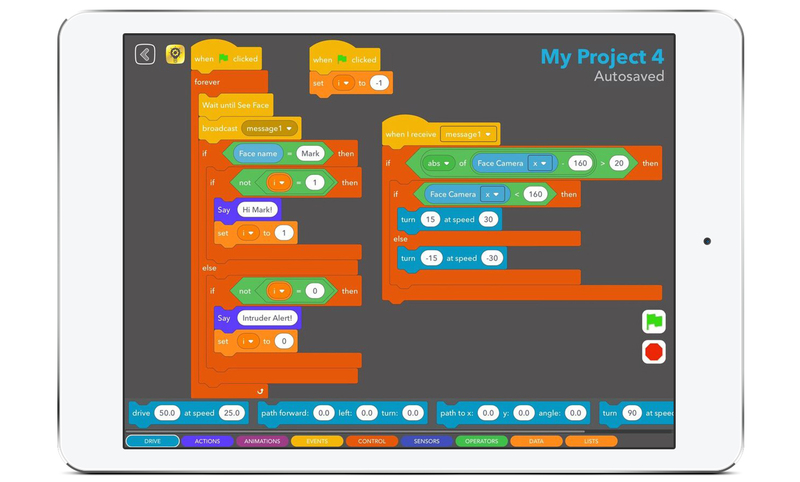 It’s not as direct as Apple’s program, which teaches the iOS/macOS Swift language, but Scratch has been developed for the express purpose of building skills that are applicable for all sorts of programming languages. The jury’s still out on how useful these sorts of coding tools are, since it’s still early days for most of them. But one of the things Cozmo’s got going for it on this front is wide install base. Anki hasn’t shown off actual sales figures, but the little robot generated some big buzz over the holidays. It temporarily sold out just ahead of Christmas, and, as Anki helpfully pointed out, NPD ranked it as the number two premium toy in the U.S. this past holiday season. And with Anki making Code Lab a free update the Cozmo app, there’s minimal friction for adoption. The app is pretty similar to a lot of educational coding tools out there. Kids are asked to solve different problems using a sequence of code prompts that are dragged on dropped onto a timeline. Each block has a pre-determined action that cover a number of Cozmo’s activities, like moving forward and backward, lifting its arms and head and triggering various facial animations. The tasks start simple and get more complex from there. It’s a pretty minor addition, and probably not worth Cozy’s $180 asking price alone (though even then it’s a lot cheaper than Sony’s Koov). But for those who’ve already picked up the robot, it’s a cool way for intellectually curious kids to get in its head and maybe spark some real interest in coding and computer science in the process. Code Lab is available today as a free update for Cozmo owners.